One of my cousins was married on a plantation in Louisiana. I was in college at the time, and I always loved weddings because it was one of the few times I got to see most of my mom’s family together all at once. Still, it felt weird that it was happening at a plantation. My cousin worked there as a chef, so there was a logical connection to the place. But…it was a plantation. 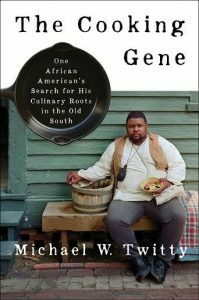 One of the things I found fascinating about Michael Twitty in his book The Cooking Gene is that he regularly goes to places like the plantation where my cousin was married as a culinary historian and historical interpreter. He creates meals using techniques and technologies of the past. I didn’t really know that demonstrations like that were a thing, and knowing that they are–in fact–a thing and that Twitty, a black man, was conducting these demonstrations made me feel the same uneasiness I felt at that wedding years ago. I felt a strong liberal guilt about why this history is being recreated and for whose enjoyment. It made me uncomfortable, and I wondered if these kinds of demonstrations were maybe A Problem. Maybe this shouldn’t be a thing. But that is the wrong impulse. Because it overlooks the fact that Twitty has agency and has chosen to do this work. It also fails to understand why this work is valuable to him. Twitty’s interest in researching the history of these foods is about him seeking things he feels are important and that he wants to see preserved. That is an idea that would never have occurred to me because of my particular perspective on the South, slavery, and the Civil War. That is why reading is so cool because it helps me discover ideas that I would never have come to on my own. I learn answers to questions I didn’t even know to ask. This book can be really academic, and for a minute upon reading the first few pages I put the book down and thought, “Am I smart enough to read this?” Not because I am dumb but because I have been reading a lot of lighter fare, and my brain quickly realized this book would take more focus from me. Twitty is very good at explaining the cultural significance of Southern food and its African influences, but it is a book I had to stop regularly to process. Some parts of his research appealed to me because it taught me things about Southern food that I never knew even though those foods are connected to vivid memories of my own childhood. As a kid on my grandmother’s farm, I picked and shelled wash tubs full of black eyed peas, and unlike shucking corn, I found shelling peas really satisfying. I also adore a good batch of black eyed peas, but I didn’t know how or why they had come to be part of the Southern diet. Weirdly, I also got very excited whenever there was mention of eating squirrel. Some of the men in my family hunt squirrel, and I have at times played that fact really close to the vest because I have gotten some stunned reactions when I mention it. Once, during dinner, my grandfather got up and walked to the sliding glass door to pick up a BB gun and shoot at a squirrel getting after his tomatoes. At the time I had a huge crush on a boy who was a vegetarian, and I briefly imagined how he would react to that scene. But squirrel, like deer and fish (and opossum, which Twitty discusses but which my family does not eat) is a source of protein that can be had quite cheaply if you have a little real estate on which to hunt it yourself. The culture and social justice issues around food also connected with my own upbringing. My parents have almost always had a garden to grow tomatoes, cucumbers, zucchini and other staples. Twitty’s book has a section on both the historical and modern day significance of farms and growing your own food as a source of healthy eating and empowerment. He also articulates things about Farmer’s Markets that I have felt but never been able to explain. I connected less with Twitty’s interest in genealogy and tracing his family history because I have never really understood why people find that subject interesting. But Twitty points out that few people whose ancestors were slaves can trace their family tree back beyond a few generations. Genealogy for Twitty involved DNA tests like 23 and me, painstaking study of poorly kept records, and a great deal of uncertainty. The amount of work he does is astonishing to me since I have a book of family history that a relative compiled and gave me and a few other family members as gifts. I never read it. Is my disinterest in genealogy a function of the ease with which I can access it whenever I want? I had never considered that before, but it feels very true. This book took time. I had to renew my library copy twice before I finished it. But it made me think about foods that are familiar to me and my concept of “Southern” food quite differently. This entry was posted in BS Reads and tagged Books, BS Reading Project, Michael Twitty, Southern literature, The Bitter Southerner, The Cooking Gene. Bookmark the permalink.